(Photo Credit: Adrian Pingstone/Public Domain)The Houses of Parliament in England are seen across Westminster Bridge in a 2005 photo. 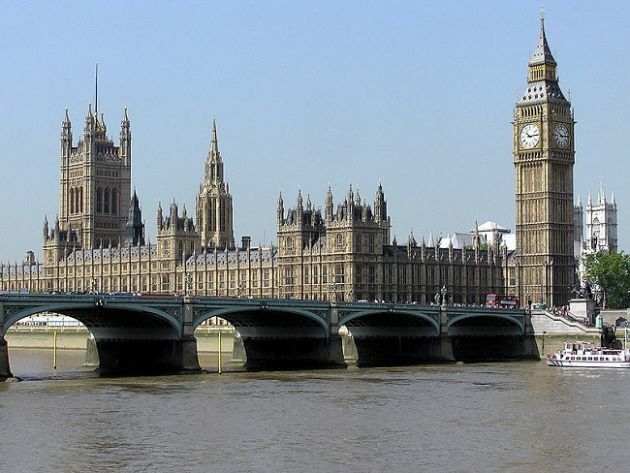 Shock and outrage at the terror attack carried out next to the UK parliament apparently in the name of Islam was expressed by Christian and British Muslim leaders as all faiths rallied the day after the attack. The man responsible for the attack was not from Iraq, Syria, Libya or Egypt, but was born and grew up in Britain. British Muslim leaders condemned the terrorist attack in Westminster, with many imams expected to express shock and horror at Friday prayers, The Guardian newspaper reported. More than a dozen faith leaders – Muslims, Hindus, Christians, Sikhs and Jews – met officers at Scotland Yard, the police headquarters, on March 23 to discuss responses to the Westminster attack the day before. The Muslim Council of Britain, which condemned the attack and offered prayers for the victims on the day of the attack, issued a further statement the day after, praising the London's Metropolitan police, the prime minister and the mayor of London, who is a Muslim. The group's general secretary, Harun Khan, said: "This attack was cowardly and depraved. There is no justification for this act whatsoever. The best response to this outrage is to make sure we come together in solidarity and not allow the terrorists to divide us." The British-born jihadi who killed four people and injured 29 in Westminster was revealed by police as middle-aged man with a criminal career who the MI5 intelligence agency had investigated in the past and had a previous conviction for stabbing a man. English teacher Khalid Masood, 52 was a 'lone wolf' attacker, who was living in the Birmingham area, had a series of convictions for assault and other crimes. Scotland Yard revealed how Masood was known by a number of aliases and The Daily Mail reported he was born Adrian Elms to a single mother in Kent before his religious conversion to Islam. The Archbishop of Canterbury, Justin Welby, described the incident the terror-inspired killing in the name of Islam at the UK's Houses of Parliament as "brutal and senseless", while Cardinal Vincent Nichols said it was "terrible". After Britain's deadliest terror attack in 12 years on March 22, World Council of Churches general secretary Rev. Olav Fykse Tveit offered sympathy for those who lost loved ones from both Great Britain and other countries. The group calling itself Islamic State said the attack was carried out by one of its fighters in which four people, including the attacker was killed and scores injured as he ran amok with a car, before stabbing a police officer. The ISIS-linked Aamaq news agency said March 23 that the person who carried out the "attack in front of the British parliament in London was a soldier of the Islamic State." Pope Francis sent a telegram expressing his condolences to the victims of the terror attack at the House of Parliament in which the attacker killed four people before armed police shot him dead. Addressed to the Archbishop of Westminster, Cardinal Vincent Nichols, and signed by the Cardinal Secretary of State, Pietro Parolin, the telegram conveys the Pope's promises of prayers and spiritual closeness to the grieving families, as well as his spiritual solidarity with the whole people. Welby is as the spiritual head of the Church of England a member of the upper chamber of the UK Parliament, the House of Lords and spoke there about the attack on March 23. He said he wanted to acknowledge, "The work of so many members of the public who pitched in and did what they needed to do, when faced with things for which they had never been trained or prepared. "Yesterday afternoon, one of our own security staff at Lambeth Palace, a Muslim, arrived at the gate having been missed by the vehicle very narrowly, and spent time helping those who had been injured. It was typical of this community and this country that he refused to go home until the end of his shift, and simply spent the time doing his job as he expected." Welby said, however, he wanted "in terms of values, to refer to something that seems to me to go deeper, to something that is really at the foundation of our own understanding of what our society is about, and to do that in three very simple, very brief pictures. "The first is of a vehicle being driven across Westminster Bridge by someone who had a perverted, nihilistic, despairing view of objectives of what life is about, of what society is about, that could only be fulfilled by death and destruction. "The second is of that same person a few minutes later, on a stretcher or on the ground, being treated by the very people he had sought to kill. "The third is of these two Houses, where profound disagreement, bitter disagreement, angry disagreement is dealt with not with violence, not with despair, not with cruelty, but with discussion, with reason and with calmness." For his part Tveit said, "I speak for the whole fellowship of Christian churches around the world when I say that we unconditionally condemn this criminal act of terror, whatever the motivation behind it have been, and we stand in solidarity with you in these difficult and trying circumstances." He urged the WCC's churches which represent more than 560 million Christians and all people in Great Britain and elsewhere to stay strong in their faith in God and also in their commitment to God's love. This he said embraces all, and God's reign, holds out hope for a just and inclusive society, one of compassion and reconciliation. "It is sorely needed now," Tveit wrote. The aspiration of an inclusive society is tested by such events as this attack, he noted. "Yet It was St. Bede who summoned a vision not only of individual Christians healing the wounds of their neighbours but also of a whole compassionate community - a cradle of redemptive love - leading the way to reconciliation through practicing the values of the reign of God."